Thanks to a technique that reveals galaxies in 3D, astronomers can now show that many galaxies have been wrongly classified. Davor Krajnovi\’c argues that the classification scheme proposed 85 years ago by Edwin Hubble now needs to be revised. The edge-on foreground galaxy (horizontal) and the background galaxy (Vertical). For full caption, please refer to the end of the article. Credit: Jayanne English (U. of Manitoba), Judith Irwin (Queen’s U. ), Richard Rand (U. of New Mexico) and collaborators in the CHANG-ES consortium, NRAO VLA, NASA WISE & Spitzer missions, NOAO, and SDSS. Astronomers studying gas halos around nearby galaxies were surprised when detailed studies with the National Science Foundation’s Karl G. Jansky Very Large Array (VLA) showed that one of their subjects is not a single galaxy, but rather two, nearly perfectly superimposed on the sky to masquerade as one. The discovery allowed them to use the alignment to learn otherwise-unobtainable facts about the nearer galaxy. As part of a study of 35 galaxies, the astronomers observed one called UGC 10288, a spiral galaxy more than 100 million light-years distant that appears edge-on as seen from Earth. Their multiple VLA observations in 2011 and 2012 produced the best radio-telescope images of that galaxy ever made. The detailed images surprisingly revealed a more-distant galaxy, with strong radio emission, almost directly behind UGC 10288. 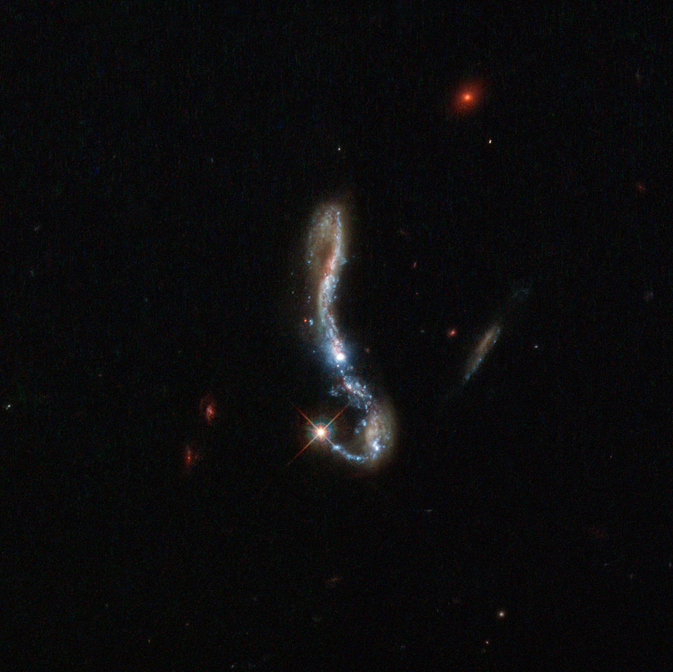 In previous images, the two galaxies had been blended together. The background galaxy is nearly 7 billion light-years from Earth. “This changed the picture, quite literally,” said Judith Irwin, of Queen’s University in Ontario, Canada. “It changed our understanding of the characteristics of UGC 10288, but also gave us an unexpected new tool for learning more about that galaxy,” Irwin added. The alignment of a foreground galaxy with such a strongly-emitting background galaxy with extended jets probably is the first such alignment found, the astronomers said. The first insight gleaned from the improved images was that UGC 10288 is not forming stars as rapidly as the astronomers first thought. 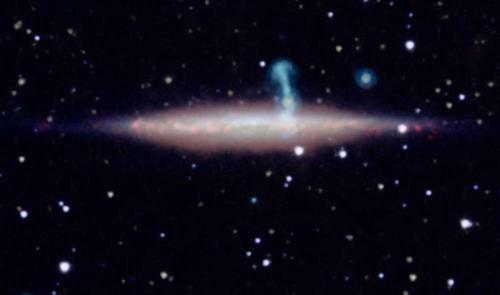 This is because much of the radio emission in the previous, blended images came from the background galaxy. The new images also showed that the gas in the galaxy’s “outskirts,” high above its spiral disk of stars, is not a single, smooth halo-like envelope, but instead forms smaller, discrete features. One of these features is arc-like, rising more than 11,000 light-years above the disk. The background galaxy, and the fact that it is aligned with its radio jets perpendicular to UGC 10288’s disk, provides a valuable means of studying the nearer galaxy. “We can use the radio waves from the background galaxy, coming through the nearer one, as a way to measure the properties of the nearer galaxy,” said Jayanne English, of the University of Manitoba. 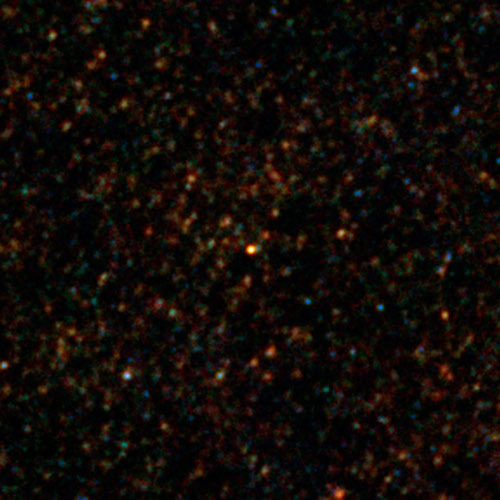 Preliminary use of the more-distant galaxy in this manner has given the scientists some magnetic-field measurements of different portions of UGC 10288. The researchers plan to do additional analysis of their data to make more such measurements. “We’re getting a nice scientific reward from the unexpected discovery of the background galaxy,” Irwin said. “Ironically, we would not have included UGC 10288 in our original study if its radio brightness had not been boosted by the background galaxy in the earlier images,” she added. Irwin and English worked with an international team of astronomers from North America, Europe, and India who are part of the Continuum Halos in Nearby Galaxies — an EVLA Survey (CHANG-ES) consortium. The scientists reported their findings in the Astronomical Journal. Galaxies come in two main types: spirals galaxies, like our Milky Way. and elliptical galaxies, which don’t contain such intricate structures. Some of the largest galaxies in the Universe are ellipticals, with some containing many trillions of and weighing in at thousands of times the mass of our own Milky Way. However, there has long been a question over how they built up such a large collection of stars, as they appear to have stopped forming them long ago. One proposal is that they started of relatively large and gradually built up by consuming of lots of smaller galaxies. Another idea is that they are the result of just a couple of two large galaxies colliding – a so-called “major merger”. The latest discovery was found as a bright red dot in a Herschel image, just one of thousands in a large area of sky studied in the constellation of Cetus the Whale, and goes by the name “HXMM01”. Detailed observations from ground-based telescopes showed that it is was a pair of galaxies, just 60,000 light years apart and in the process of merging together. These galaxies themselves are relatively large, each containing several times as many stars as the Milky Way, but are all but invisible at optical wavelengths, due to thick, obsuring clouds of gas and dust. Herschel, which observed in the far-infrared, is able to see through this dust to the action taking place within. The galaxies are seen as they were 11 billion years ago, when the Universe was only around 3 billion years old, and the expectation is that they would have merged to form one massive galaxy over the course of the next few hundred million years or so. “These galaxies entered a feeding frenzy, which would have quickly exhausted the food supply in the following hundreds of millions of years, leading to the nrely-forming galaxy’s slow starvation” commented Hai Hu, of University of Irvine, California, and the lead author of the latest paper. These are forming stars at a prolific rate, equivalent to 2000 suns being born every year – around a thousand times faster than our Milky Way is today. The cause of this rapid starbirth is the huge reservoirs of gas and dust in the galaxies, roughly equal to the mass of the stars currently there. Although it is unclear how they built up such a massive gas supply the expectation is that in a billion year or so, when most of the gas has been converted into stars, the resulting mammoth galaxy will contain the equivalent of 400 billion suns – not far off the most massive galaxies known to exist. The fact that this is such a quick event, at least by cosmological standards, is why snap-shots of massive galaxies in the process of merging are so hard to find, with only half a dozen or so seen so far at this early stage in the Universe’s evolution. Despite their rarity, such mergers of massive galaxies could play a key role in the formation of the most massive elliptical galaxies we see around us today. Visible as a small, sparkling hook in the dark sky, this beautiful object is known as J082354.96+280621.6, or J082354.96 for short. It is a starburst galaxy, so named because of the incredibly (and unusually) high rate of star formation occurring within it. One way in which astronomers probe the nature and structure of galaxies like this is by observing the behavior of their dust and gas components; in particular, the Lyman-alpha emission. This occurs when electrons within a hydrogen atom fall from a higher energy level to a lower one, emitting light as they do so. This emission is interesting because this light leaves its host galaxy only after extensive scattering in the nearby gas — meaning that this light can be used as a pretty direct probe of what a galaxy is made up of. 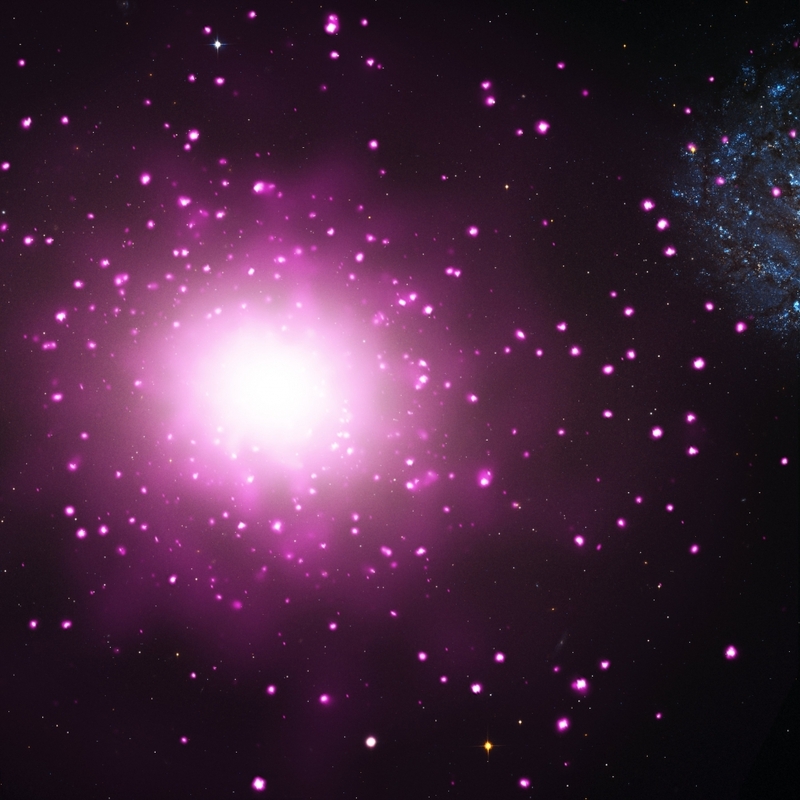 The study of this Lyman-alpha emission is common in very distant galaxies, but now a study named LARS (Lyman Alpha Reference Sample) is investigating the same effect in galaxies that are closer by. Astronomers chose fourteen galaxies, including this one, and used spectroscopy and imaging to see what was happening within them. They found that these Lyman-alpha photons can travel much further if a galaxy has less dust — meaning that we can use this emission to infer how dusty the source galaxy is.